Aereo, the company responsible for putting the fear of God in the big four television networks, and for giving every IP attorney from New York to L.A. reason to re-read the Copyright Act’s Transmit Clause, is back in the news. In case you missed last year’s Supreme Court decision, Aereo’s over-the-air streaming television service was ruled to be in violation of the Copyright Act, essentially starting the countdown on the company’s remaining time as a going concern. However, at the time of that verdict, the technology behind Aereo appeared to have legitimate value, and many predicted that an opportunistic buyer would eventually capitalize on that value. Now, it seems, that time has come. As part of Aereo’s bankruptcy proceedings, longtime digital video recorder (DVR) provider TiVo purchased much of the company’s intellectual property. 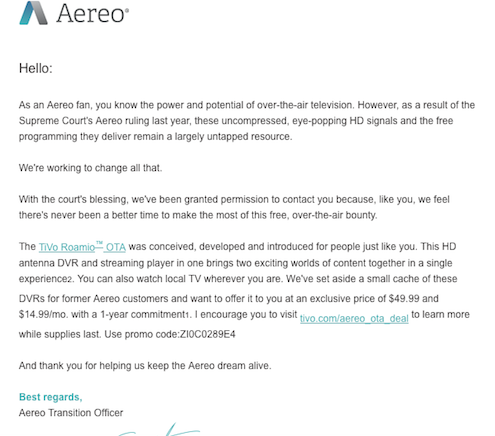 And based on a blast email sent out to Aereo’s old subscribers earlier this month (included below), it looks as though TiVo is rolling out a modified version of Aereo’s over-the-air cloud service, called TiVo Roamio OTA. To be clear, TiVo did not purchase any patented Aereo technology, nor did it buy any of the thousands of physical miniature antennas Aereo once leased to its subscribers. The reportedly meager $1 million amount that TiVo paid reflects this. What TiVo did get, though, is access to all of Aereo’s old customers, and the right to use its trademarks and Internet domain names. So while the Aereo name may live on in some capacity, Roamio appears to be wholly built on existing TiVo infrastructure. But just like Aereo did before it, Roamio promises to give users the ability to capture, record and replay over-the-air television signals without a cable subscription, and view their favorite network TV shows whenever and wherever they want. The most obvious question of course is: if Roamio does essentially the same thing as Aereo did, then why isn’t it also illegal? Without plumbing the details of the underlying technology too deeply, since all of Roamio’s technical specs haven’t been sussed out yet, there is one major difference that’s apparent right off the bat. Aereo, as originally conceived, was a service provider that controlled over-the-air broadcast signals and manipulated them on its user’s behalf. It re-broadcast them, recorded them, stored them, and played them back. On the other hand, TiVo appears to be selling a product that, much like its traditional DVR offering, allows users to perform all those functions for themselves. While that distinction may seem trivial, it was the singular question before the Supreme Court in American Broadcasting Cos., Inc. v. Aereo, and the reason the Court ruled the way it did. Aereo was deemed guilty of directly infringing the networks’ copyrights because it retained the requisite control over the broadcast signals for its service to constitute an unauthorized public performance. TiVo on the other hand, by relinquishing that control to its users, could not, in theory, be held directly liable. And since TiVo would likely be shielded from secondary liability by the fair use principles established by the landmark Supreme Court case Sony v. Universal City Studios, Roamio probably wouldn’t indirectly infringe the networks’ copyrights either; not any more than the VCR manufacturers infringed the movie studios’ rights in the 1980’s and 90’s. Roamio would essentially allow TiVo customers to do what they’ve already been doing for over a decade: use their DVRs to record live shows for later viewing, a practice known as time shifting. The only difference is that now they won’t need a cable box to do it. Then again, there are indications that TiVo may be planning to go the licensing route and negotiate with the networks to pay fees for their content in exchange for rebroadcasting rights. If that’s the case, and Roamio only distributes licensed content, then the infringement question—direct or indirect—goes away entirely. Either way, and all puns notwithstanding, this is a development worth watching. The content of this blog is intended for informational purposes only. The information provided in this blog is not intended to and does not constitute legal advice, and your use of this blog does not create an attorney-client relationship between you and attorney Brian J. Meli. Under the rules of certain jurisdictions, the material included in this blog may constitute attorney advertising. Prior results do not guarantee a similar outcome. Every case is different and the results obtained in your case may be different.